This spacious detached home enjoys a corner plot position in this peaceful cul-de-sac which is within walking distance of sought after nearby schools and within easy reach of Loughborough's Endowed Schools campuses. The property has been substantially extended and offers three generous reception rooms, modern re-fitted kitchen and five bedrooms plus master en-suite, family bathroom, conservatory and double garage with plentiful parking and lovely views to the Charnwood Forest. Epc - The property's EPC was carried out in 2012 and the property enjoys an excellent rating of 81/100 (B) thanks in no small part to the modern boiler and Solar voltaic panel system. Frontage - The property is set well back from the cul-de-sac with a long block paved drive leading to a wider parking area which leads to the garage and to the property's left side via a wide gated entry ideal for refuse and recycling bins. Double Garage - With double up/over door to front and pedestrian access door to the garden at the side. Cloakroom - A covered lobby between the house and garage with door to the side garden and recessed utility meter boxes. Ground Floor Wc - 1.97m x 0.74m (6'6" x 2'5") - With ceiling light point and coving, two piece suite comprising vanity wash-basin and WC with hand jet. Internal window to the cloakroom. Lounge - 5.52m x 3.58m (18'1" x 11'9") - With laminate floor and feature fireplace with living flame fire inset, LED TV recess, Two double radiators, wall and ceiling light points and uPVC bow window affording a pleasant outlook to the front elevation. Kitchen - 3.73m x 2.97m overall (12'3" x 9'9" overall) - Plus recess with under-stairs pantry off. Fitted with a modern range of units with stone work-surfaces and contemporary downlighting, space for range cooker and undercut sink with drainer and mixer tap. Radiator and coved ceiling with track light. Conservatory - 3.09m x 3.09m (10'2" x 10'2") - Of uPVC construction with brick base and french doors to the patio, glazed to three sides with ceiling light point. Utility Room - 1.95m x 1.88m (6'5" x 6'2") - With uPVC window to the property's side and space and plumbing for american style fridge freezer, wall mounted consumer unit and Worcester boiler. En-Suite Shower Room - Recess with large shower cubicle fitted with thermostatic shower with hand jet and rain head, towel radiator, pedestal basin with splash-back and WC with hand jet adjacent. Coved ceil with light point, extractor fans and shaver socket plus uPVC window to the property's rear. Bedroom Two - 3.66m x 2.99m max (12'0" x 9'10" max) - Coved ceiling with light point, radiator, uPVC window to the property's front elevation affording lovely views across the close to the Outwoods and Beacon Hill in the distance. Bedroom Three - 3.67m x 2.46m (12'0" x 8'1") - With radiator, ceiling light point and uPVC double glazed window to the property's side elevation. Bedroom Four - 3.08m x 2.44m (10'1" x 8'0") - With ceiling light point, coving, radiator and uPVC window overlooking the property's garden. Bedroom Five/Study - 2.88m x 2.22m (9'5" x 7'3") - With radiator, coved ceiling with ceiling light and uPVC window to the property's front elevation affording views across the close to the Outwoods and Beacon Hill in the distance. 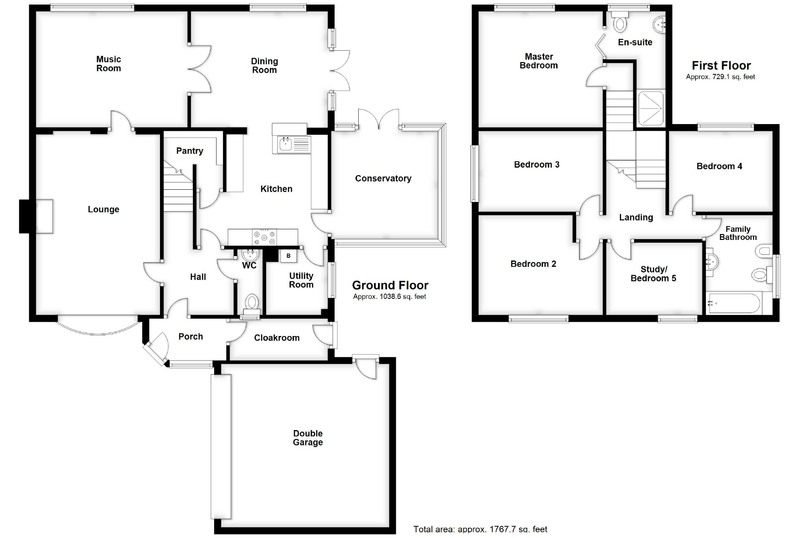 Family Bathroom - 2.98m x 1.98m (9'9" x 6'6") - With a four piece suite comprising vanity wash basin with storage and mirror unit above, panelled bath with mixer shower and tiling, close coupled WC and bidet with hand jet. Towel radiator, coved ceiling with down-lights, uPVC window to the property's side elevation. Gardens - The property's garden extend to the rear and side and offers a substantial patio which wraps around the conservatory and has an ornamental pond which features a re-circulating stream which babbles from the foot of the plot, under the decking area and over a small waterfall. The garden is otherwise mainly laid to lawn plus shrubs plants and fruit trees with a greenhouse and a mixture of hedging and fencing to the boundaries.